but most useful in slower shaft speed applications. 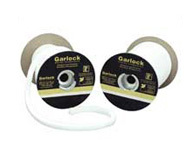 Its PTFE dispersion provides a low friction finish and prevents leakage through the braid. Style 5888 is resistant to all chemicals but molten uranium salts. Completely asbestos-free, with very little water absorption, this packing is often used in check and needle valve stems, reciprocating rods, rams, and plungers, and safety injection system valves. For oxygen service, specify Style 5895.